Are you missing opportunities for growth that are right in front of you? In today's volatile economic environment, filled with uncertainty and sudden change, the forces pushing you to stay focused on the core business are extremely powerful. Profiting from the core is crucial, but the danger is that overfocus on the core can blind companies. Scanning the horizon for new markets and new products can also be tempting, but risky. Fixating too much on either strategy can cause you to miss the substantial opportunities for growth that are often hidden in plain sight, at the edge of the core business. 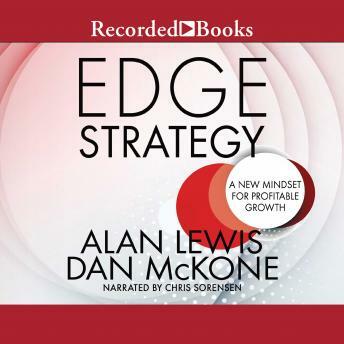 In this insightful yet practical book, strategy experts Alan Lewis and Dan McKone articulate a mindset that helps leaders recognize and capitalize on these opportunities. The Edge Strategy framework challenges how the boundaries of your existing products and services map to your customers' views of the world and then provides three different lenses through which you can see and leverage value: - Product edge. How to capture incremental profits and other benefits by slightly altering the elements and composition of a core offering - Journey edge. How to create and capture extra value by adjusting your role in supporting the customer's journey to and through your offering - Enterprise edge. How to unlock additional value from resources and capabilities that support your core offering by applying them in a different context, for a different offering or different set of customers With engaging examples across many industries, Lewis and McKone coach you on how to identify and assess each of the different "edges" and then provide concrete insights and advice on applying edge strategy and tactics to use in specific business contexts. The book concludes with a ten-step process to help executives and managers find and leverage the edges in their own companies. Edge Strategy is the concise, hands-on guide for growing your business by getting more yield from assets already in place, relationships already established, and investments already made.